Come to the French River area to take pleasure in our fishing for awesome walleye, northern pike, large and smallmouth bass, crappies, and muskies. Come and enjoy excellent meals from our American Plan resorts and lodges. If you want to fix your own meals there are plenty of housekeeping cottage resorts available as well. Kayaking and bird watching are popular pastimes, but we also have wildlife viewing, bear hunting, and boat cruises too . Browse our list of lodges below and plan your vacation today! Crane's Lochaven Wilderness Lodge is located on a 4 square mile island, Commanda Island on the junction of Wolseley Bay, the North and Main Channels of the fabulous French River. This is where you will have access to some of the prime fishing waters for walleye, bass, northern pike and muskie fishing, all of which may be caught within sight of our resort. Our Full American Plan Package includes all meals, boat, motor, seats with all required boat equipment, unlimited gas, ice and live bait, applicable fishing license and services such as daily maid and dock service as well as fish cleaning, packaging and freezing. All 15 fully serviced private log cabins have been arranged to give the best possible view of the river from the private sundecks. We are family owned and operated since 1973 and pride ourselves in catering to the needs of our guests. Season is May to Oct.
For some of the best fishing in the French River area, come enjoy the waters of Fish Tale Cabins and Campground! On the Wolseley River, which flows into Wolseley Bay, the waters just outside your accommodations are home to trophy muskie and walleye, as well as small and largemouth bass, northern pike and more. Enjoy the comforts of home in the evening in our fully equipped cabins or in your recreational vehicle on our campgrounds. Our cabins are complete with four piece bathrooms, fridge, stove and microwave. All are fully equipped with bedding, blankets, kitchenware and more. Our RV sites come with hydro, water and sewage hookups. 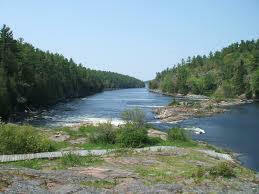 The French River area has more to offer than just fishing, though. Paddle in the pristine waters, or take a long walk with Mother Nature and see what the area has to offer. Feeling sportier? Golf courses nearby offer great greens and the chance to watch for the local wildlife. Once you’re done for the day, come back to the lodge and have a home cooked meal before relaxing with your friends and family. You can tuck in for the night at our housekeeping cabins, stocked with bedding, linens and kitchen appliances. Choose from one, two or three bedroom cabins, fully equipped kitchens and two-piece bathrooms, or bring your trailer up to our grounds! Hookups are available for water, sewage and electricity. 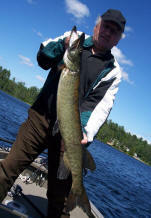 The waters of the Upper French River have long been known for their abundance of giant muskellunge, the king of freshwater fish. Deriving its name for this sought-after gamefish, Lunge Lodge sits perched on the edge of 50,000 acres of sparkling Canadian water. For more than 40 years, Lunge Lodge has provided anglers and their families access to this unspoiled wilderness. Why not experience it for yourself? Clean cottages, personal attention, outstanding home-cooked meals and recreational activities make this the ideal place for family vacations and unique fishing adventures with friends and coworkers. The waters of the region abound with muskie, northern pike, walleye, small and large mouth bass and plenty of delicious panfish. We are located on the south shore of of the unspoiled Trout Lake with facilities designed to offer a year-round escape to experience the beauty of Rainbow Country. Trout Lake is sixteen miles long and half a mile wide and is located eighteen kilometers from the village of Alban. The clean pollution-free water is noted for lake trout, pike, muskie and bass. Trailer and camping sites are available by the day or week and are located close to the central washrooms. 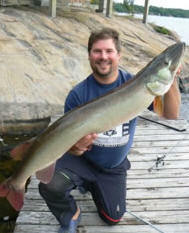 We offer Fishing, Hunting, ATV & Snowmobiling on Trout Lake in the French River Resort Area. We offer 16 clean and comfortable cabins ranging in size from 1 to 4 bedrooms. Originally built in 1928, we have made every effort to maintain the rustic charm of each cabin while adding the services which will make your holiday comfortable and safe. All housekeeping cabins have Fully equipped kitchens, 3 piece bath (shower), all bedding, Charcoal Barbeque, Picnic Tables and conveniently located firepits throughout the camp. For Your Convenience The Main Lodge offers a restaurant and bar serving beer, wine and coolers.